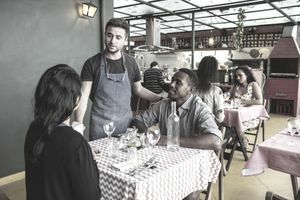 Restaurant owners have to know and understand the state and federal employment laws that affect their businesses, such as the Fair Labor Standards Act (FLSA) and others that relate to minimum wage, overtime, and tips. Failure to comply with these rules can result in hefty fines from local, state, and federal authorities, not to mention potential lawsuits from employees, so it's well worth your time to educate yourself if you're don't already have a pretty good handle on these things. Minimum wage varies by state so check with your local government to find out what it is for hourly employees as well as servers in your location. Keep in mind that if the federal minimum wage is higher than the minimum wage provided for by your state, you must pay the federal wage, and if your state's wage is higher, you must pay that. Employees in these states are entitled to whichever rate is higher. The federal minimum wage is $7.25 an hour as of 2018. It's higher in at least 18 states. Servers have a separate minimum wage in some states because they also collect tips. This is referred to as the "tipped minimum wage" and it also varies by state, ranging from $2.13 an hour to as much as $9 or more per hour. A server must earn enough in tips to equal the tipped minimum wage. Otherwise, his employer must pay him the difference. The US Department of Labor offers an easy to read graphic about each state's requirements around minimum wage and tipping. Tipped employees must be paid a wage under the terms of the FLSA. Tips always belong to the employee, although they can be credited toward the employee's wages when you're calculating minimum wage as outlined above. Employees pool their tips at some restaurants. This means that they all put their tips in one pot at the end of the night and divide the total up equally. This is a completely voluntary practice. Employers cannot force their staff to use this option. Overtime refers to hours worked beyond the standard 40-hour week. Employees are to be paid time and half when they work overtime. If a cook is paid $12.00 an hour and he works 45 hours, five of those hours must be paid at $18.00 an hour. It's a good idea to limit overtime whenever possible or your payroll costs could skyrocket. Occasionally, an employee might offer to work overtime for his regular wage just to get more hours. You can't comply even if he's willing to work for his regular wage. You're required by law to pay him overtime for all hours over 40. The hours a minor can work and the job positions he can hold are another area where the rules can between states. For example, a minor can work at age 15 in Maine, but he can’t serve liquor until age 17, nor can he pick up knives, even to wash them. It's considered too dangerous. Minors also have very stringent hours they can work during the school year. Always verify a minor's age with a birth certificate or a driver's license. It's not always sufficient just to take his parent's word for it. You'll want to be sure of and verify the work eligibility of alien workers or immigrants. The last thing you need as a new restaurant owner is to be accused of hiring illegal immigrants simply because you didn’t validate visas and/or work permits.